One of the aims of “Raise the Bar” was to ensure ballot measure campaigns would have to earn buy-in from voters in rural parts of the state. Supporters of the education ballot measure campaign were able to do that. In the sprawling, rural Senate District 35, represented by Republican Sen. Larry Crowder and stretching 300 miles across 16 counties from Wolf Creek Pass to the Kansas border, the campaign needed to find 1,844 people willing to sign for the measure — and was able to get 2,416. 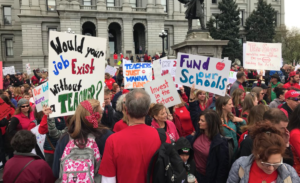 …Weil credits a few factors in successfully getting the measure on the ballot beyond a sales pitch centered on improving public schools in a state where teachers walked out of classrooms to rally for more funding and where about half of the school districts have cut back to four-day weeks. The campaign also was made up of a coalition of 20 different organizations including unions who had been working on the issue for two years and relied on a massive volunteer mobilization. From here, there’s only one more test, and the bar is higher at the polls too. It’s a cynical reality that the Taxpayer’s Bill of Rights, which hamstrung the legislature’s ability to respond to the state’s evolving needs including education, would have failed had Amendment 71’s 55% threshold been the law of the land back in 1992. But today, we have a measure that has passed all our state’s self-imposed hurdles. Amendment 73 satisfies TABOR in letter and spirit, and made the ballot despite the higher standard required under Amendment 71. All of which should count in its favor with voters. What is the definition of high income earners? Is your link clicker busted? We'll see. I'm a definite no. First school tax I think I'll ever have voted against. Perhaps we'll find a way to get one on the ballot that more fairly divides the burden between corporations and people. Sudy, do you mean you want business to pay even more than it would under 73? No. I'll put my math together in a presentable format over lunch. If I haven't blundered (always possible, often likely), the reduction in property tax significantly outweighs the expected revenue from the income tax change. If that's true I'm paying for schools, and a corporate tax break, which would be insane. Like I always say, feel free to show me wrong. I'm probably showing my ignorance here, but what is the difference between increasing taxes on wealthy individuals and increasing taxes on corporations? After all, most corporate profits go to wealthy individuals, right? That's probably too simple, but why? If my math is right, they’re raising taxes on me (not wealthy, but middle class) and lowering them on corporations. Why would I pay for that? People of all income levels pay higher property taxes than they would without this measure. This is more than just a higher marginal income tax rate. I get that, but that's not my point. If the owners of corporations end up paying more (net) through increased personal income tax, doesn't that more than offset the drop in non-residential (business) property tax? What percentage of corporations paying tax in Colorado are owned solely by Colorado residents? Not nearly all Colorado profits accrue to Coloradans, who would then pay income taxes on them. So, no, I'd think. Don't we already have enough budget chains already built into the Colorado Constitution? Nearly all of the state level political speeches I've heard this year included nasty references to TABOR, Gallagher, and Amendment 23 — suggesting the "Gordian knot" needs to be cut. Adding another layer of "forever" taxation and spending without knowing the impact of varied economic conditions or dramatically changing mandatory spending requirements seems like a short term "solution" that will turn and bite hard.